5. You don't need 10 fps for birds. I had a great time and will definitely be going back the next couple of weekends. I'll also be trying to use the tele-converters the next time I am out. I am also in the process of moving all my pictures over to Zenfolio. I evaluated both SmugMug and Zenfolio and in the end Zenfolio resonated with me much more. 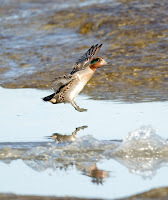 I have a few more pictures in my Palo Alto baylands gallery. Technical Specs: Canon 1D3, 500mm f/4 IS, f/4, 1/2000s, ISO 320.